Nestled in a valley, Alwar is a relaxed and laid-back city in the state of Rajasthan. 140km northeast from the state capital of Rajasthan Jaipur, the city is brimful of culture and heritage. Apart from the fort that stretches along a high craggy ridge, Alwar, a former princely state in the British India, offers a number of palaces, museums and tombs, as well as an unpretentious atmosphere, making it a favourite with many tourists. 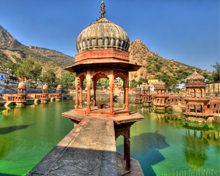 Headquarters of the district of the same name, Alwar is the most convenient base for visiting other places of tourist attractions in the district. Chief among them is Sariska National park which is natural habitat to a rich variety of flora and fauna. In addition to the tiger, Sariska is home to leopards, the Bengal tiger, hanuman langur, golden jackal, sambhar, chital, jungle cat, nilgai, striped hyena, chinkara and plenty of bird species and reptiles. Few visitors leave Alwar in Rajasthan without visiting Sariska National park. The park is also frequented by locals in their own vehicles. Within the bounds of the Sariska National Park you will find many historical sites including the Kankwadi fort, constructed by Jai Singh II. The fort was used by the sixth Mughal Emperor Aurangzeb to imprison his eldest brother Dara Shikoh when the former was bitterly engaged with his brothers in the struggle for succession of the Mughal throne. Tradition has it that Pandupol in the hills in the centre of the Sariska National Park was one of the retreats of the Pandava brothers of the Mahabharata fame when they were spending their time in exile. Hanuman temple in Pandupol is a famous site of pilgrimage which attracts many people. 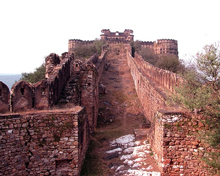 The imposing fort of Bala Qila is one of the most sought after tourist destination of Alwar. Stretching along a high craggy ridge, the fort was built before the coming of the Mughals. The Mughal emperor Jehangir was exiled in the fort when he rose in rebellion against his father Akbar, the greatest of the Mughals. 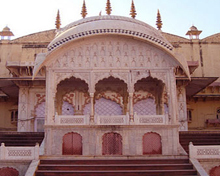 Another well known tourist attraction of Alwar is the City Palace which houses the eclectic Alwar Museum where one can find wonderful weapons, royal objects displaying the opulence of the rulers in the days of yore. The piece de resistance of the museum is the 11th-century sculpture of Lord Vishnu. Jaipur, the capital of Rajasthan, is the nearest airport. Delhi is 200 km from Alwar. You can fly to Jaipur or Delhi and proceed to Alwar by road or rail.